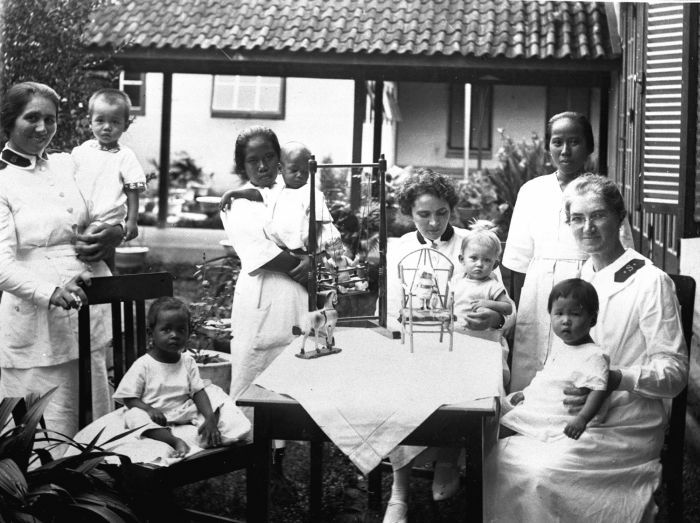 At Surabaya the Salvation Army founded a mother and child clinic in 1917. The hospital was recorded as a category II hospital and was subsidized.The hospital was named after the founder of the Army, William Booth Hospital. Its subsidy was f 18,500 in 1929 for 50 beds. Nowadays (2018), the hospital still exists and is situated on the Jalan Diponegoro no. 34 at Surabaya. It is registrated with the Ministery of Health with no. 3578031. It is classified as a category C hospital and its name is Rumah Sakit Umum William Booth Surabaya.It has a capacity of 121 beds (2 VIP, 13 class 1, 59 class 2 and 47 class 3). It has 43 nurses and some 60 doctors are linked with the hospital. In 2014 the hospital had 50,814 outpatient visits and 4,598 inpatient admissions, whose average length of stay was 4 days. Its BOR rate was 37.79 % and the number of inpatient days was 13,098.